With the wars already winding down, should the savings count toward a debt deal? NEW YORK (CNNMoney) -- Senate Democrats want to cut an eye-popping $1 trillion in war spending over the next 10 years. The proposal is part of the plan Senate Majority Leader Harry Reid announced Monday to raise the debt ceiling through 2013 and slash $2.7 trillion overall. But many Republicans aren't likely to buy it. The argument goes like this: Reid's proposed cuts for spending in Iraq and Afghanistan aren't real because Democrats are working off an inflated number that assumes the wars will continue at full tilt for the next decade. And since the Obama administration has already started to wind down the wars, the extra money was never going to be spent, and shouldn't count as a cut. "That's going to be a tough sell in some circles," said Douglas Holtz-Eakin, a former CBO director and president of the conservative American Action Forum. "They're not going to be viewed as real spending cuts." Indeed, Sen. Jon Kyl, the No. 2 Senate Republican, called it "phony scoring." Claims of budget savings often center around which budget "baseline" lawmakers are using for comparison. And Reid is using the Congressional Budget Office baseline as his starting point. Because of the rules Congress itself has set, the CBO is required to take current war funding levels in Iraq and Afghanistan and extend them far into the future. Plus inflation. "The way the CBO baseline is calculated is real simple," said Holtz-Eakin. "You take what is on the books and extrapolate at the rate of inflation." But that isn't the best reflection of reality. War spending is at elevated levels at the moment. And it should soon decline. A lot. 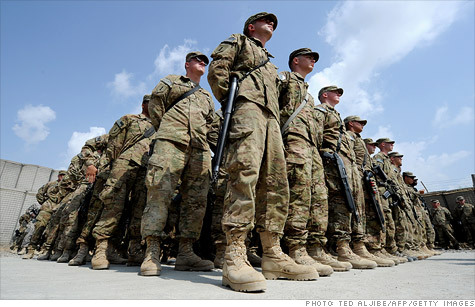 The Obama administration has already announced plans to bring a large number of troops home. That will save tons of money, and it will happen whether Reid's plan is approved, or not. In its January fiscal outlook, the CBO itself laid out the difference. In 2010, there were an average of 215,000 U.S. troops deployed for war-related activities. If that number were to drop to 100,000 in 2013 and 45,000 in 2015 and beyond, the savings would be significant. "Under that scenario, total discretionary outlays for the period from 2012 through 2021 would be $1.1 trillion less than the amount in CBO's current baseline," the report said. Travis Sharp, a fellow at the Center for a New American Security, said it is common for both parties to count savings this way. "Both Democrats and Republicans tend to count cuts in planned future spending as real cuts," Sharp said. "And both parties tend to use the baseline that casts the best light on their policies." If Republicans don't buy that the cuts are real -- they will have yet another reason to reject Reid's deal. One of their most steadfast demands has been a debt ceiling hike that is matched dollar for dollar by spending cuts. Sen. Chuck Schumer said Monday that Republicans have to accept the savings as legitimate. But clearly, he anticipated the objections from the other side of the aisle. "We know that some Republicans will quibble over these savings, but they have no leg to stand on," Schumer said. "If conducting the wars adds to our debt, it's undeniable that winding down the wars delivers savings." Schumer's argument rests in part on the fact that Republicans counted the same savings as part of Rep. Paul Ryan's budget that was approved by the House earlier this year. "They never criticized such accounting then," Schumer said. "It's hard to see how they could do so now."